Early electrostatic Oscilloscope (Oscillograph) tube with rounded face. 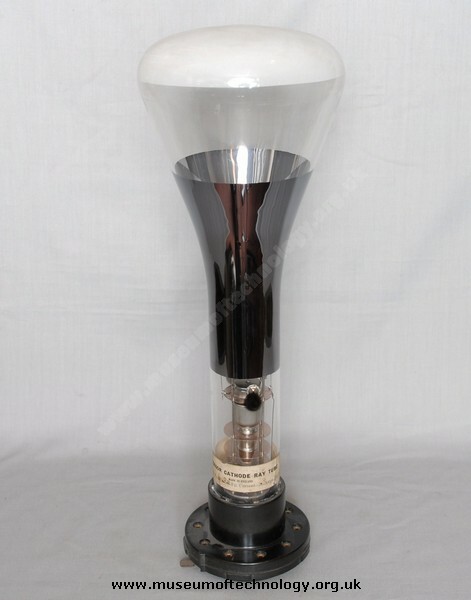 Known at this time as an Oscillograph tube, and used for the display of oscillating waveforms. The Type J screen gave a light blue response, and the Type H gave a sepia toned picture. Sizes of this range of tubes went up to 10 inches. IN 1937 Radar had not been developed yet and TV was still in its infancy, EMI had not yet developed 405 line TV, and Baird was still in competition with EMI with his Televisor.